It took me forever to get around to blogging about these because it took me forever to finish binding the second one. It just sat there with the binding attached waiting for it to be tacked down. It only took me an evening in front of the TV watching old SVU episodes (mmmmm, Elliot) to get it done, so it was silly of me to let it go for so long. Besides, I feel bad about letting quilts languish. Socks go without partners for years. Shawls hang out in a box waiting to be bound off. I feel no guilt about that. I’ll get to those projects when I get to them if I ever feel like getting to them. Quilts I feel the need to see through to completion. I had a little help with this top. Since we had no power at the time due a fallen tree that thankfully only took down a power line and didn’t hurt anyone, I went over to Stacie’s to work on these. I like to have two quilts ready for class – one to show as my finished prototype and another to use as the demo for whatever techniques we’ll be covering in class that day. While I quilted and attached the binding on the first one, Stacie assembled the second top for me. 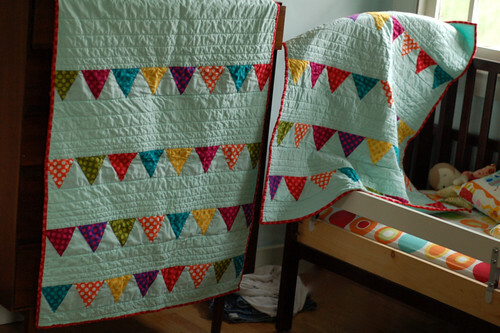 I had already pieced the strips of triangles (the bunting); she put together the strips for me. Thanks, again, lady! While they may seem identical, I quilted one using a warm cream thread and the other using white. This resulted in one seeming slightly warmer and the other a slightly cooler shade of aqua. 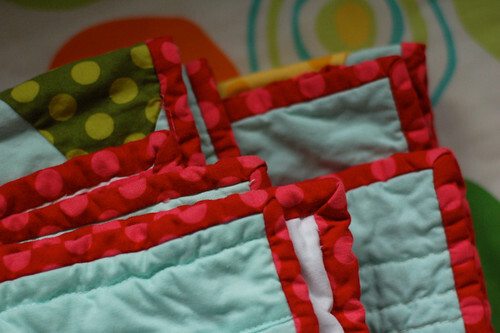 Funny how that can be achieved just through the quilting, but I guess with a certain amount of echo lines, the color you choose for the quilting is going to have a greater impact on the finished piece. One of these quilts has a corner that’s opened a bit. I’ll take care of that in the morning when I have good light here. For now, that’s the story on these two…. I may be teaching the class again in March or so. We’ll figure that out in the new year. you do beautiful work. wow! Jason and Holly are lucky friends!